Support thread for the "Category Popular Products Carousel for osC 2.3.4 bootstrap" add-on. Can be used with the "Modular Category Page" add-on http://addons.oscommerce.com/info/9448 or as a stand alone add-on. This add-on adds a carousel/sliding "Popular Products" module to the category pages and can be added to the front page. Ability to highlight hot selling items. This add-on relies on jQuery Owl Carousel v1.3.3 for carousel sliding effects. More information can be found here "http://owlgraphic.com/owlcarousel/". jQuery Owl Carousel is included with this package and is installed separately as a heater_tag module. jQuery Owl Carousel handles responsive carousels a lot better than Bootstrap carousel version. It automatically adjusts the number of items inside the carousel according to the viewport size. this is a great mod...works beautifully. I install this addon on a new OSC EDGE store, but nothing appears. I Check all the installation steps and all appears to be ok.
What could be happening? Do I need to install Modular Category Page? No, you do not need to install "Modular Category Page", but you DO need to have the below code inside index.php as per the install instructions and by referring to the sample index.php file provided in the package. Also check that you have correctly enabled the settings for this module in admin. 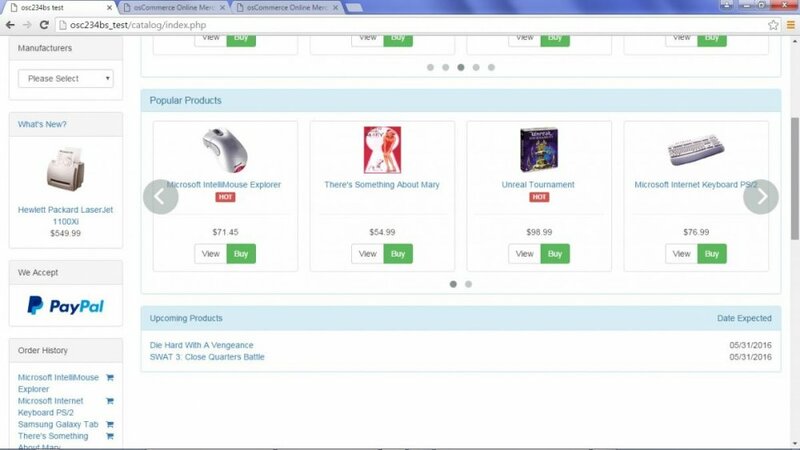 You also need to have sold items in the store as this module works like the "bestsellers" box module. If you enable the bestsellers box module does it display? I "buy" some products and now the addon works perfectly !!! Thank you very much for your support, perhaps a good idea would be to add this comment to the installation instructions. perhaps a good idea would be to add this comment to the installation instructions. I thought that it was pretty obvious, how else would products become popular if they are not sold. Doco states "Ability to highlight hot selling items." Also, some module options would indicate that items need to be sold. A standalone version, and 3 versions if you have the more recent versions of osCommerce BS EDGE that now include modular index and modular category pages, including an extra one for the sub-category product pages. Included in instructions is to check that you have the latest code (necessary for correct operation of this add-on) inside "catalog\includes\classes\currencies.php", same as latest EDGE. Added version check (so that in future, if only the module file needs to be replaced, the version number of the module will update without removing/re-installing the module). Corrected the names of the template files to be consistent with osCommerce naming standards for template files. Brought module up-to-date with latest osCommerce BS EDGE coding standards i.e. microdata, replace deprecated $HTTP_* vars with $_*, hardcode DIR_WS_* file paths and compatibility with PHP7. Included an option to display the old product price along with any special prices. Fixed issue where sometimes too much white space would appear within the product description. Module checks to see if the "Index Nested - Product Listing" module is installed (this combines popular products in the current category and all it's subcategories to show in the carousel). Added option to show and "x" to allow the Popular Products Carousel to be closed (except on front page). jQuery Owl Carousel has been updated to v1.2.